Scenic flight Kathmandu / Taplejung / Kathmandu. 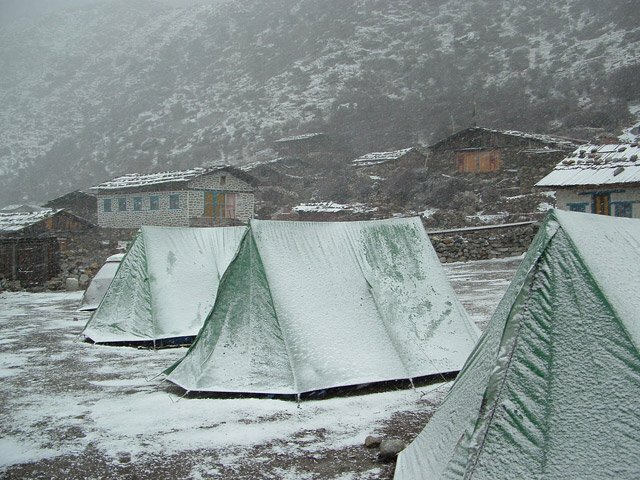 Explore 02 Base Camps in Kanchenjunga, Makalu and Everest. Famous for Flora and Fauna on Top of that very rich area to explore of Rhododendron in Nepali ‘Laliguras’. Living different communities mainly dominated by Rai and Limbu. 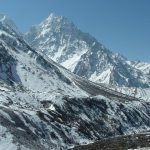 Kanchenjunga Trek takes us to base camp of world’s third highest peak Mt. Kanchenjunga (8,587m) located at Taplejung district of eastern Nepal. 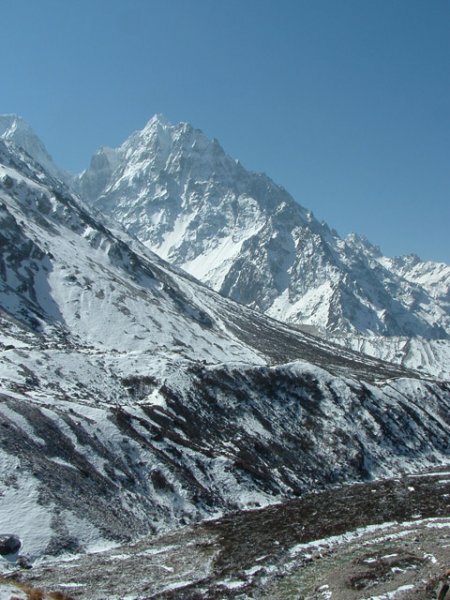 It offers spectacular Himalayan views, this trek is mostly regarded as one of the most adventurous & challenging trek. It lets you explore local tradition, culture while passing through lush green forests, fields, high passes and small settlements. Kanchenjunga trek initiates by boarding an hour flight to Taplejung from Kathmandu. After arriving at Taplejung, we start trekking onward to our next destination of Lali Kharka. Crossing various suspension bridges over the river streams in Khasawa, small villages in Mamankhe and ridges in Yamphudin, we arrive at Chitre. On our way to Tseram, we pass through beautiful rhododendron forests and slowly we will be seeing the incredible views of grand Himalayas with Yaglung glacier. In our next adventurous days, we will witness the breathtaking views of three main summits of Kanchenjunga. 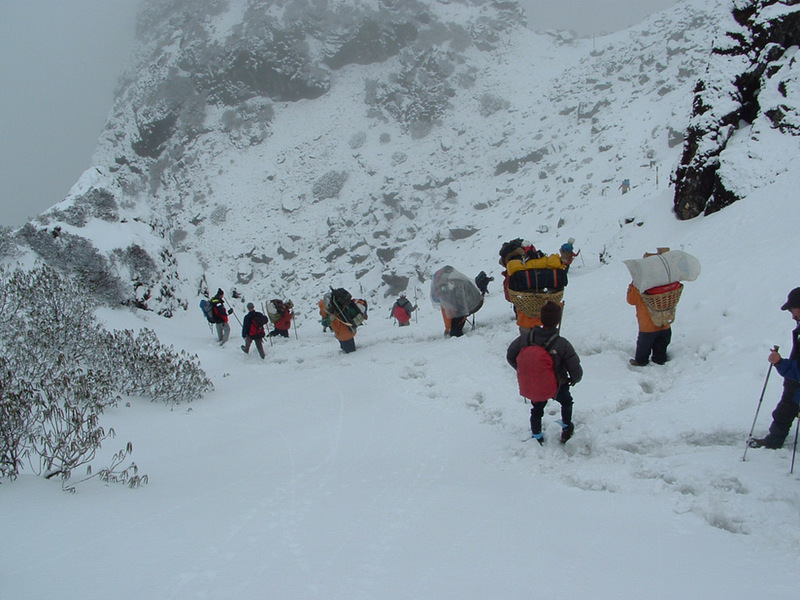 Highlights of this trek are also the visit to Frozen Lake, Striking Streams and magnificent Mt. Jannu. In the same way, the great views of Mt. Everest, Mt. Makalu, Mt. Lhotse and Gyakulng Kung are also seen from Mirgin La Pass. Further we, will be trekking towards Ghunsa, Kambachen, Lhonak, Pang Pema & Kanchenjunga Base Camp in 20th day. From here we trek for next couple of days to Suketar via Sekhathum and Chhiruwa. With all the adventurous memories of encountering flora, fauna and Himalayan views along cultural exploration we fly back to Kathmandu from Suketar Airport in Taplejung. In this way, we plan on concluding our flamboyant through our 27-day Kanchenjunga Base Camp Trek. Kanchenjunga climb is a long, exhausting and challenging trek which requires high level of physical fitness and previous trekking experience. You can go for kanchenjunga valley trek if you want to explore the topographical variation from subtropical region to an altitude of more than 5000 meters in nearly a month-long trip, then embark for Kanchenjunga Trek with Euro-Asia to make it the most adventurous trip ever. Welcome by our representative at the airport, transfer to hotel in Kathmandu and later in the evening enjoy Welcome Dinner. After breakfast we are going to do some sightseeing activities today. As planned, we are going to explore some of the most iconic UNESCO World Heritage Sites. The trip begins with a 30 minute flight to Suketar Airport from Kathmandu. An early lunch after landing shortly in Taplejung(Suketar) is accompanied by the beginning of the trek along the ridge line to Lali Kharka. It’s a 2-3 hour short trek, leading to a grazing area. Stay overnight at Lali Kharka. Day two begins after a short traverse through the hillside followed by a short descent to reach Pakora along the Pawa Khola. Crossing the suspension bridge, the ascent towards Kunjiri begins. The team then treks over the crest of the ridge to finally reach Khasawa. Khesewa offers exotic first glimpse of the south and main summit of Kanchenjunga and the Yalung Kang. 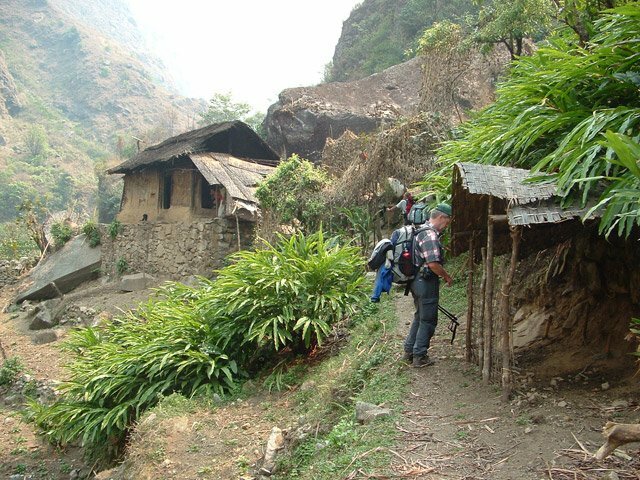 The trek today covers steep hillside path through the terraced fields above the Kabeli Khola. The path continues along a rolling terrain with some shady spots for rest. Along one of the shady areas, the team passes Anpan, before the descent towards Khasawa Khola. After crossing the Khasawa Khola, the ascent now begins through the terraced fields, to the village of Mamankhe. The trek begins along a fairly level terrain today, to climb to Yamphudin. The trail contours along the hills above Kabeli Khola with several ups and downs to cross the ridges and stream beds making up the valley. The river eventually becomes level with the trail a few hours before reaching Yamphudin. The river consists of some beautiful spots for a relaxing bath. A couple hours more, and the team would reach Yamphudin. Yamphudin is a gorgeous village tucked away beneath the ridge of Deurali Danda, and is one of the most remote settlements in this area until the team reaches Ghunsa. The trek beyond Yamphudin offers a glimpse of the rest of the trip, which begins with a steep ascent. Traversing through pleasant forests and beautiful meadows capturing stunning views of the Kanchenjunga, the team descends steeply towards Omje Khola, to cross the bridge, and to finally reach Chitre. The day starts with a steep ascent to the crest of the Deurali Danda for three hours, through dense forests. Deurali Danda pass at 3230 meters offers magnificent views of Jannu. The trip continues through some steep and exposed areas, into the beautiful forest again and finally reaches the valley of Simuja Khola, after a sharp descent. Across the wooden bridge on the Simuja Khola is an area having numerous rocky shelters amidst towering conifers, called Torontan. Following the Simuja Khola, an interesting trek begins passing through beautiful coniferous forest, which gives way to the Rhododendron forest. As the day progresses, the forest becomes scattered and petite to finally offer the amazing views of the snow-capped mountains and the Yalung Glacier. The crown of the Kabru and Rathong peaks start to become visible over the moraine, just before reaching Tseram, a beautiful grazing area, where the falling temperatures remind the team of the increasing altitude. The trek begins with the final ascent of 600 m to reach Ramche. The the trail to Kanchenjunga South turns dangerous past the snout of the Yalung Glaciers into a series of ablation valleys, offering magnificent views of a frozen lake, clear streams and the astounding views of Koktang, Rathong and Kabru. The day begins with an amazing stroll around Ramcha, and the trail leads the team towards the first close encounter with Kanchenjunga, to view the stunning south face of Kanchenjunga and Jannu. Crossing the Yalung Ri Glacier, the trail extends towards Oktang (4730 m) along sweeping curves. The path is then suddenly confronted by the southern wall of the mountains, the vast ridge forms a cirque of over 15 km long, nowhere less than 7500 meters high, and with three main summits of Kanchenjunga at 8420 meters, 8586 meters, and 8474 meters makes the view breathtaking. Another experience this day is the impressive views of Jannu while observing the glaciers flowing from its east face. This leg of the trek takes you to the high altitude, and requires determination and some luck too, in terms of good weather while crossing the high mountain passes and logistic support. The rest of the day is for acclimatization at the high altitude. Stay overnight at Yalung Ri Base Camp. The team descends towards Ramche today, along the trail through the Yalung Glaciers and a series of valleys, offering a good walk and perfect camping spots. Also noticeable is a frozen lake, clear streams and magnificent views of the Himalayan panorama. The trail descends towards the valley, passing the turn off to the high and challenging Labsang La route to Ghunsa and the north side of Kanchenjunga. The trail being dangerous and rough for the porters in particular, the team takes the southern trail of the pass beginning with the Mirgin La. Mirgin La is approached after an initial steep climb and several false summits, which offers magnificent views of Jannu, along with Makalu, Gyakung Kang, Everest, Lhotse and Chamalang on the horizon. The view extends to the southern plains to see the Terai, which makes up for all the effort for the day. After 6-7 hours of rigorous trek, the trail crosses the pass, and comes to an end at Mirgin La for the day. Stay overnight at Mirgin La. The trail today offers beautiful scenery passing through four alpine passes along with short descents between them. The trail then descends to Lamba Sumba Kharka offering you a few more glimpses of the Southwest Face of Jannu. The descent from Lamba Sumba Kharka gets easier through a pleasant forested trail to the village of Ghunsa. Ghunsa is a picturesque Tibetan village offering alluring sights of civilization with prayer flags fluttering from the wooden houses and a couple of monasteries, after many days of wandering through the wilderness. On offer in this village is a local specialty, ‘Tongba’, a curious alcoholic drink. Tongba is offered on a jug or a large bamboo cup, having fermented millet seeds and filled with boiling water. The flavor and alcohol seeps though a special straw, a worthy sip in a freezing region after a long day. The trail ascends gradually towards the south of the Ghunsa Khola across flood plains to finally emerge into a beautiful pasture on the north of the river. The trail extends with a steep climb across a slide area, finally descending into Lakepo. Further ascent from Lakepo takes the team to the village of Kambachen. The day is allocated for leisure for acclimatization after two weeks of strenuous ups and downs along the Himalayan wilderness. The team can rest all day, or then enjoy hiking to explore the area around Kambachen. On offer are great views of the peaks near Kanchenjunga, and a short hike up the ridge for enthusiasts presents better views of the Himalayas, or then a day’s hike takes you to the Jannu Base Camp. The day begins with a gradual climb through the rocky fields to Ramtang (4240 m). The trail then continues to cross the northwest of the Kanchenjunga Glacier, to reach Lhonak. Lhonak is located on the sandy plains near a dry lake-bed, which is very windy, and has scarcity of water. The panoramic view of the mountains is amazing from Lhonak. The trail gradually ascends from Lhonak, which gets steeper following the moraine. Pang Pema is at an elevation of 5140 m and is reachable after four hours of ascent from Lhonak. The views of the main peak of Kanchenjunga is the main attraction from Pang Pema since it is visible from anywhere else. Pang Pema is the base camp for expeditions on Kanchenjunga. Stay overnight at Pang Pema. The day begins with a morning hike up a ridge, north of Pang Pema to Kanchenjunga Base Camp. An ascent of about 300 meters provides a platform with amazing views of the breathtaking Kanchenjunga, Wedge Peak, the Twins and Tent Peak. The trail then continues with a quick descent to reach Kambachen after about five hours. The trip from Kambachen follows a descent to reach Phole and then continues towards Ghunsa. Phole is a village which has two parts, the upper part housing the well-established Tibetan Refugees and the lower part is the winter village of Ghunsa. The trip takes about 6 hours and offers a tinkle of the Tibetan culture, and “Tongba”, a local spirit which contains fermented barley seeds topped with boiling water. Passing through the beautiful village of Ghunsa, the next destination is Yangswa, an ideal place for camping. Then the trail passes through beautiful forests opening out to steep, grassy hillsides to Amjilossa. Continuing the descent after a short climb for almost all day, the team reaches Sakathum in about five hours. Sakathum is located in the confluence of the Tamur and Ghunsa Kholas. The trip begins by crossing the Simuja Khola originating from the south base camp of Kanchenjunga, the same river that the team followed while ascending from Torontan. Having reached low altitudes, the climate gets pleasant, and is signified by cardamom growing freely in the moist, shaded forest. Crossing numerous small tributaries along the track, the team finally reaches Chhiruwa after almost five hours, a village set amidst large boulders. The trekking day comes to an end with traversing along the trail, in and out of minor valleys on the way to Suketar. 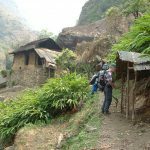 The total trekking time of five hours continues through the succession of picturesque villages along the trail and ends at about mid-day. The remainder of the day is off for leisure and rest after the long trek. The trip ends with a scenic short flight from Suketar Airport to Kathmandu, enjoying the last glimpses of the astonishing mountains that the team encountered during the trek. Later in the evening enjoy Farewell Dinner. 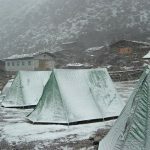 27 Days Camp Trek as per program with English Speaking Sherpa Guide and porters on full board basis. All camping equipment’s like sleeping tents, dinning tent, kitchen tent, toilet tent, dinning Table/Chairs etc. Daily Allowances, insurance, equipment’s, medicines and food for camping staff. Flight Kathmandu / Taplejung / Kathmandu Hotel / Airport. Any Services mentioned in cost includes section.